Not so long ago, the elevated cargo train tracks that span over 30 NYC blocks, from the Meatpacking District to Midtown, were in a desperately neglected state. 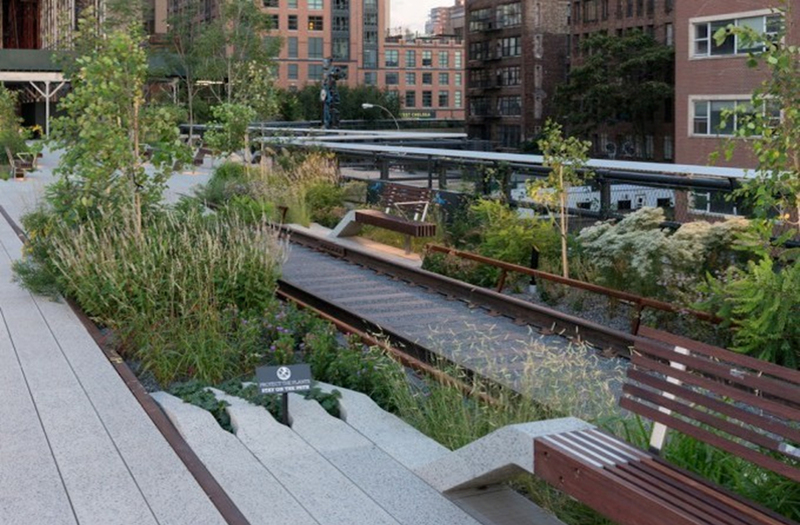 Today, the final section of this gloriously restored historic landmark — the famous High Line park — is open to the public. Parts of the old railway have been restored and modified, and combined with modern, clean adaptations of the same materials to create a unique and welcoming respite from the city on the streets. Native wildflowers and grasses and many types of birds mingle with the architecture along these landscaped 1.5 miles — an homage to the many manifestations of life in this neck of the woods. © Copyright 2019 Helene Barkin. All rights reserved.